When Wasps, Yellow Jackets or Hornets build their nests a little too close to human habitat, they can become quite a nuisance or even a real threat to small children, animals, and people with allergic reactions to insect venom. If provoked, or when their nest is threatened, Wasps, Yellow Jackets and Hornets can and likely will sting more than once, and their sting can hurt very badly. Faced with the problem of an active nest close by, a can of insect poison spray often seems like your only option. Not only are these chemicals extremely dangerous and potentially deadly to humans and pets alike, their success rate is only mediocre at best. Dan The Bee Man will remove stinging insects from your property, home or business, without the use of any poison, insecticides, or other dangerous chemicals. Dan The Bee Man has the experience and know-how to remove or extract stinging insects and their nests by whatever means necessary, and we will give you a complete explanation of what will be required to do the job before any work begins. If it is an aerial nest, Dan The Bee Man will remove the entire nest, place it into a bucket, and remove it from your property. If the nest is underground, Dan The Bee Man will dig it up, place all nest parts into a bucket, and remove it from your property. If the nest is inside a wall cavity, in most cases an access hole has to be cut into the wall to remove the nest. Dan The Bee Man will explain exactly what may be necessary to remove the nest before any cutting takes place. Once access to the nest has been facilitated, the nest and its occupants are vacuum-extracted and removed from your property. As pollinators, Honey Bees and Bumble Bees are an important part of the agricultural life cycle. Honey Bees pollinate nearly half of all food we eat. When Honey Bees or Bumble bees live on your property and become a nuisance, do not kill them! Dan The Bee Man can capture them alive, remove them from your property, and re-locate them to a new home. Bumble Bees typically nest underground, in old bird houses, and occasionally in walls or attics. They can usually be removed by digging them up or by vacuum extraction. 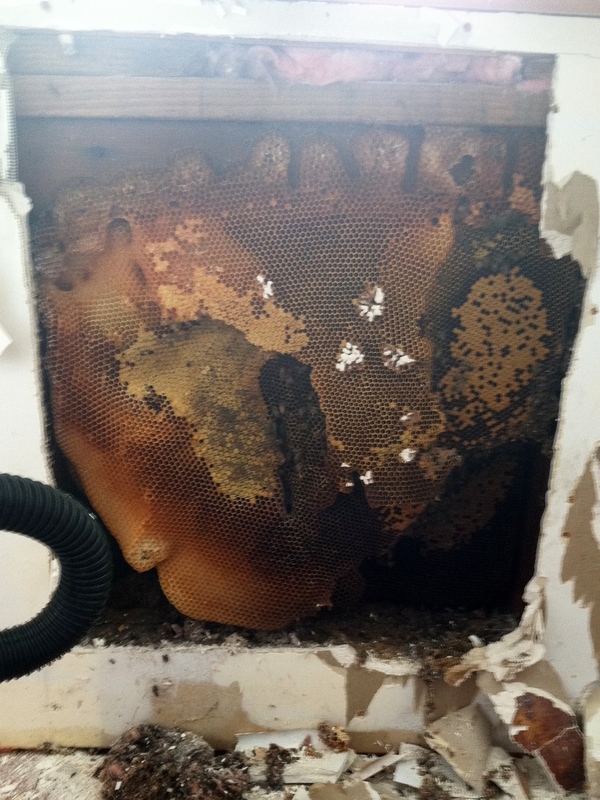 Honey Bees can occupy wall cavities, chimneys, or attic spaces. They create wax comb in their space, and likely will store honey. Removing Honey Bees can be fairly difficult, because all wax and stored honey must be removed, because it can melt and ferment once the bees are no longer there to keep it cool. Melting wax and fermenting honey can lead to substantial damage of the structure, and attract other pests. When you call Dan The Bee Man to take care of your stinging insect problem, you will have peace of mind knowing that the entire nest and its occupants will be removed from your property, and absolutely no poisons or other dangerous chemicals will be applied or left behind on your property.